Have you ever wondered what causes some companies to earn free publicity from customers who gush about them? Meanwhile, countless brands toil away in obscurity hoping someone will notice them. The difference? Talk triggers. These are the qualities that spur word-of-mouth marketing. They are the talkable parts of your brand. This differentiator could be as simple as freshly baked cookies (in the case of DoubleTree by Hilton hotels) or a few free french fries (in the case of Five Guys), but it must be something that is literally remarkable — people cannot help but share the story. As compelling as your talk trigger might be, that doesn’t mean it will appeal to every potential customer. Regardless of its quality, there’s no such thing as a universally adored differentiator. To understand this phenomenon, we have to acquaint ourselves with the different types of customers who interact with our talk triggers. While researching for my new book, “Talk Triggers,” I conducted a survey of more than 1,000 random consumers. After extensive conversations, I found that they naturally fall into four categories: uniqueness seekers, experience advisors, fundamentals fans, and skeptics. 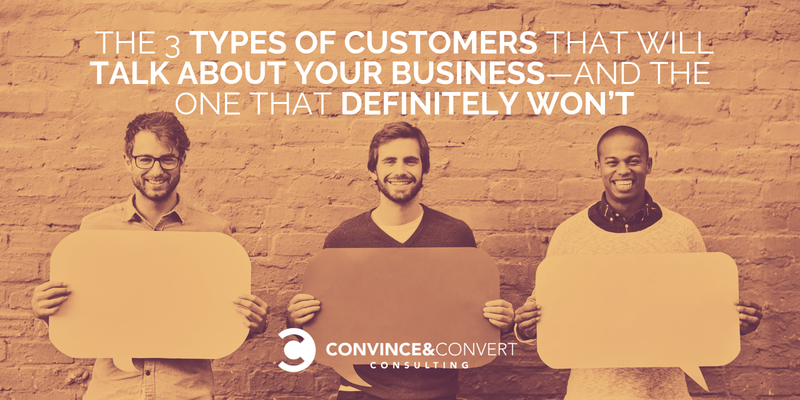 Understanding these four personas is the key to defining your word-of-mouth strategy. Uniqueness seekers will love you as long as you offer something different. They come from every walk of life and age group, and their only shared trait is the joy they feel upon witnessing something new. Differentiation impresses and delights them, and they will offer you support and loyalty if your brand presents a clear point of distinction. Experience advisors are more akin to critics. They aren’t really fascinated by differentiation; they want to discuss your product simply because that conversation makes them feel like an expert. This group is the most likely to proactively engage in word of mouth, and these individuals are overwhelmingly young and female. Fundamentals fans are all about quality. They don’t look for differentiators as much as a good value, solid customer service, and a product that won’t let them down. This group tends to be older, with nearly half ticking the “45 or older” box. They’re generally less likely to spread the word about your brand without a little prompting, but they cannot help themselves if they feel like your offering offers true quality. Skeptics are the hardest to please. They treat differentiators with hostility, as they associate them more with gimmicks than authenticity. This group is predominantly male, and these people genuinely would prefer if every company stopped trying to be unique. Ignore them at your own peril, though. Skeptics are more than willing to talk about their distrust with others, giving them a weird kind of power over your talk trigger. Trying to impress all four of these customer categories at once might seem like an impossible task. Well, you’re right. Fundamentals fans are probably waiting to be truly impressed before they open their mouths. Meanwhile, the skeptics of the world will only purchase your product once in a blue moon (though they’ll spread the word in their own way). Those challenges don’t mean you should throw up your hands and call it a day, though. Your job as a marketer is to hold true to the differentiators you have crafted. 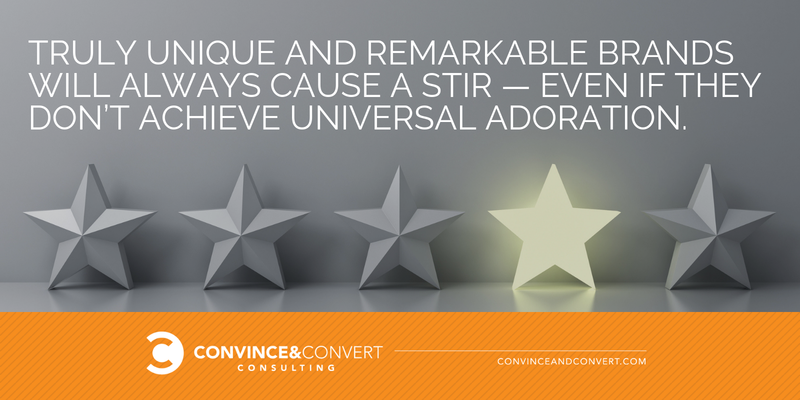 Never forget that truly different and truly remarkable brands will always cause a stir — even if they don’t achieve universal adoration. Never stop polishing your talk triggers, and don’t water them down to suit four incredibly different sets of people. The whole point of talk triggers is to stimulate a lively and compelling conversation. The only way to spark this sort of exchange is by taking a purposeful, bold stance that wears the personality of your brand unapologetically. Remember: A talk trigger is not a unique selling proposition. They are real-life attractions, chocolates on hotel pillows, and The Cheesecake Factory’s ridiculously extensive menu. They are the aspects of your business that customers cannot help but gush about the next time they enjoy a coffee with a close friend. They are the stories people tell (and retell) about your brand. Pour your marketing energy into that story, and you’re guaranteed to get at least three out of four people talking. 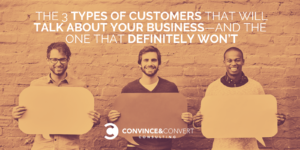 This content was inspired by research and case studies contained in “Talk Triggers: The Complete Guide to Creating Customers With Word of Mouth,” the book from Jay Baer and Daniel Lemin.